At a time when the lack of pre-1970s films on Netflix is a topic of serious despair in cinephile circles, Oldies.com offers many older, rarer and hard-to-find titles on the movie side. The suburban highway I-476, better known as the Blue Route, does not allow billboard advertising. But there is one company that’s found a way to advertise there for years, via paint on the side of their warehouse. 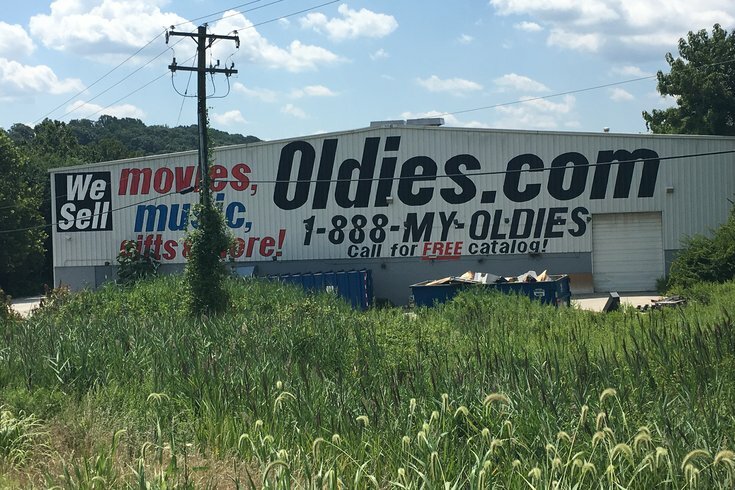 If you’ve driven south on the Blue Route, you’ve probably seen it, slightly north of the I-76 exit in West Conshohocken: a large, white warehouse, with huge letters bearing the name of Oldies.com. What is Oldies.com? It’s a business that, in this age of streaming and downloads, is still selling CDs, DVDs, and other physical media, and making a go of it selling direct, at a time when retail is in serious decline. It’s also the fascinating, multigenerational tale of a family-owned company that’s endured for decades. And it all started more than 50 years ago, when a teenage boy heard a doo wop group’s song. PhillyVoice recently spoke with Melissa Greene-Anderson, ‎Executive Vice President at parent company Gotham Distributing Corporation (and a member of the family business) about Oldies.com, that warehouse sign, and how the company makes it work selling discs and records in the 21st century. The song was recorded and first released in 1959, and didn’t make much of a dent at first. But it piqued the interest of Jerry Greene, a 17-year-old art student who worked at a record store in Times Square and also did promotional work for a radio show. Greene didn’t write the song or have anything to do with its production, but he obtained the rights to its master, re-releasing it in 1961. This time, the song was a hit, reaching #3 on the Billboard singles chart in March 1961. Greene took the money he made from that song and eventually set off for Philadelphia, where he joined with partners to found the Record Museum store, which grew to a chain of 25 locations at its height. In 1980, following the sale of the Record Museum business to the chain that became Wall to Wall Sound and later FYE, the Greenes founded the noted reissue music label Collectables Records, which, for years, distributed merchandise to all of the major (and now-defunct) music retail chains like Borders, Tower Records, Strawberries and Musicland. “When [those companies] went out of business, we lost our retailers for the most part,” Greene-Anderson, Jerry Greene’s daughter, told PhillyVoice. The company had always had a direct mail-order division, geared towards selling to collectors, but around eight years ago, it began really focusing on selling direct to consumers. It has even purchased huge libraries of vinyl records from the many record store chains that have gone out of business over the years. Oldies.com serves as the company’s online commerce business, which extends far beyond oldies – and indeed, far beyond music. This included gifts, collectables and other ancillary products – “anything pop culture that anyone who liked music and movies would be interested in,” she said. Alpha Home Entertainment is the company’s movie subsidiary. And at a time when the lack of pre-1970s films on Netflix is a topic of serious despair in cinephile circles, Oldies.com offers many older, rarer and hard-to-find titles on the movie side. And the company’s inventory is expansive. “We have hundreds of thousands [of titles] – if it’s available in the United States, in any configuration, we have it,” she said, adding that the company can outdo Amazon, in many categories, on both selection and price. As for that iconic sign, Greene-Anderson recalled the company fighting with the township about the legality of putting up signs, but eventually realizing that there was nothing forbidden about painting the name of the company on the side of the building. So they did that, therefore creating the most prominent signage anywhere on the Blue Route’s 20 miles. As for Jerry Greene, he’s still going strong at 73 and remains involved with the company along with several family members, including Greene-Anderson, and her mother, brother and husband. The company continues to sell to around 500 retail stores, while also working with radio stations. You can browse the company’s catalog at, of course, Oldies.com.